(WXYZ) — Another measles outbreak, this time in southwestern Washington state is growing. Officials from Clark County Public Health report 16 confirmed cases, with 5 more suspected. All of them are children. 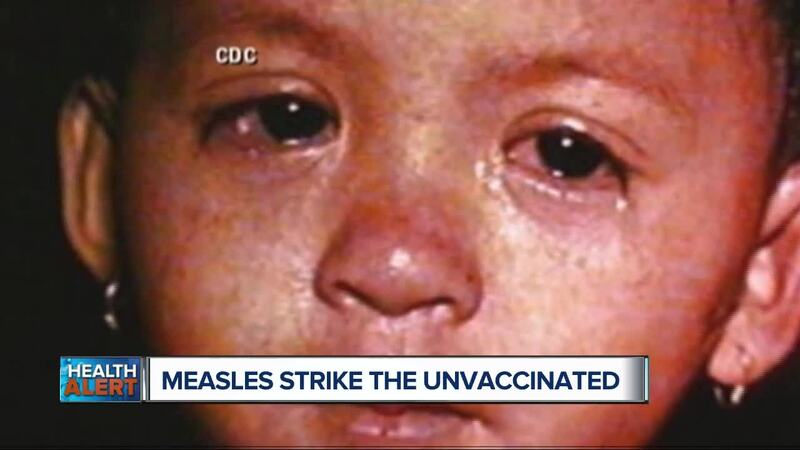 Question: This is very concerning, as we know measles can be dangerous, especially for young children. Were the children in Clark County immunized? Of the 16 confirmed cases, 14 of the children were not immunized. The other two are unverified so we don’t know yet if they were or not. But I’m not surprised the number of children infected is growing because measles is super contagious. It’s spread through breathing, coughing and sneezing. And get this, the virus can actually hang in the air, for up to 2 hours after the infected person has left that room. Question: Anti-vaxxers are now seen as a top threat to global health, can you explain why? The reason why vaccines exist is to save lives. And the World Health Organization says that every year between 2 and 3 million deaths are prevented worldwide. Which is fantastic. But that number could be a lot higher, possibly another 1.5 million deaths could be prevented if vaccine coverage improved. Now WHO has named “vaccine hesitancy”, meaning people who are reluctant or refuse vaccinations as one of the top threats to global health in 2019. And that’s because not getting vaccinated could reverse the progress that’s been made in stifling vaccine-preventable diseases like measles. Globally measles cases have spiked by 30%. And countries that were once close to eliminating this virus have seen a rise in case numbers. Question: Why are people avoiding vaccines? Some of the reasons include not having easy access to vaccines, complacency, religious reasons, lack of confidence or the belief that vaccines can lead to autism. Which is not true. Scientists around the globe have carefully studied the measles vaccine and have not found any links between autism and the MMR vaccine. The MMR vaccine stands for measles, mumps and rubella. And it’s highly effective, roughly 97 percent of people are protected following the second dose. Join Dr. Nandi this Saturday for his all-new television show. This week Dr. Nandi talks with three special guests whose lives were changed after taking on his five key personal steps to better health. Judy shed 30 pounds with Dr. Nandi’s nutrition plan. Patty’s stress turned to peace after cultivating her mind with meditation. And Greg’s depression led him to find his true purpose in life. Tune in this Saturday, January 19th, 2019 at 1 pm to hear these inspiring personal stories and learn what Dr. Nandi’s 5 key pillars are. And then you too, can change your life around and become your own health hero!